The ICL 3D Cap is a high quality 6-panel cap with embroidered ICL text on the front and crest badge on the back. 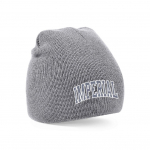 Adjustable snap panel back makes this item suitable for all adult sizes. Available in Navy or Burgundy.